So did you make any New Year's resolutions? Unlike the past couple of years I haven't really. I am trying to eat more healthily though but that was something I planned on doing anyway, I just knew it wasn't going to happen over the Christmas period. This got me thinking. I think many new year's resolutions are actually just post Christmas resolutions. For example healthy eating because you have pigged out all through December, doing more exercise as you've just been sitting on the sofa hibernating from the cold weather, being better with money because you've been spending too much on presents and giving up alcohol because you fear for your liver after all those Christmas parties. I wonder if New Year was at a different time of year it would make any difference to what people plan on achieving. To accompany this post I wanted a photo of something scrummy but naughty. I think this hits the spot. Just look at the shine on that doughnut! 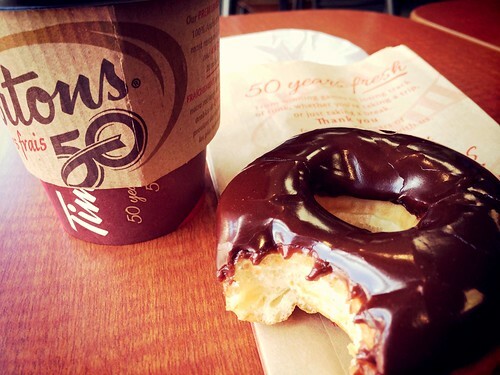 Plus it's from Canadian coffee and doughnut shop Tim Hortons which brings back lots of happy memories of my time there. I have never thought about it that way but you really have a point. I always feel like making plans when the kids go back to school in September - that always feels like more of a fresh start than January. Yes, me too. I may be 37 but I still work in school years. Even more so now I have kids of my own. I think that the end of summer is when I make most of my decisions and plans. Even if it that I plan to so something after Christmas.